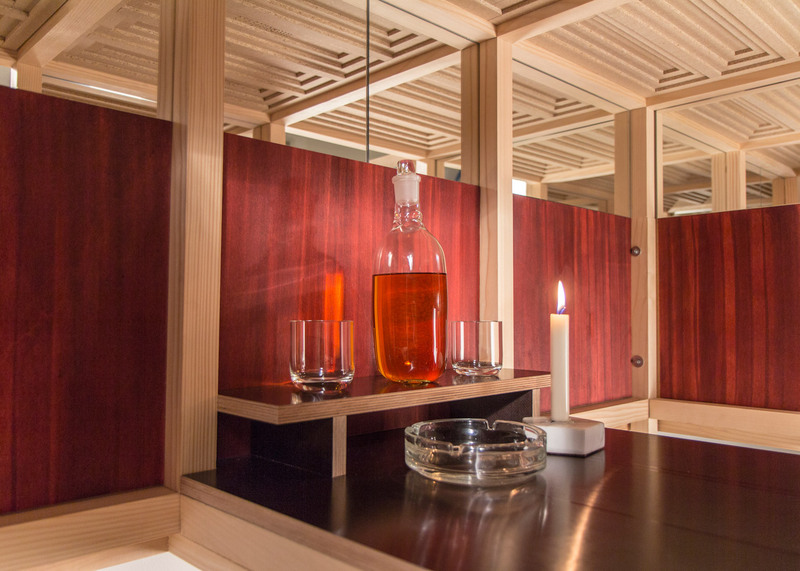 Vienna Design Week 2015: Vienna design studio Breaded Escalope has constructed a wooden enclosure that creates an intimate drinking space for two, modelled on Modernist architect Adolf Loos' American Bar. Breaded Escalope's Bar Non-Lieu looks similar to a drinks cabinet supported by long legs, but is in fact a miniature bar that can house two people sat across from each other. "The possibility to step inside and take a seat opens up a whole new perspective of the object as an atmospheric bar and extends its utilisation," said the studio. Inside, the wooden structure has features based on the interior of Loos' iconic speakeasy, located on Kärntner Durchgang in the centre of Vienna. The American Bar, also known as Loos Bar, was completed in 1908 by the architect who went on to write the essay Ornament and Crime – an influential text for Modernist architects. Three Loos-designed interiors have recently been restored and opened to visitors in the Czech city of Pilsen. His bar's stepped ceiling panels and mirrors surrounding the tops of the walls are echoed at a tiny scale within Bar Non-Lieu. Lower plywood sections are stained to mimic the mahogany surfaces used across the compact space. "The interior refers to the famous American Bar by Adolf Loos in Vienna and provides place for two people to have a drink, chat or maybe smoke a cigarette – a piece of furniture, a spacial miracle, a private retreat," said Breaded Escalope. The studio's design has two doors that open outward, allowing users to slip in to the tight space. Both can place their drinks on a central horizontal surface, and store the liquor bottle on a raised shelf. The structure is made from a pine frame. Particle board panels covers the occupants' heads and torsos for privacy, but its base is open so others can see when it is being used – similar to the Centipede Cinema project, where users manoeuvred their upper bodies into downward-pointing nozzles to watch films. For those wanting to recreate the American Bar's smoky atmosphere, a chimney to extract cigarette fumes and an ashtray pinched from the original bar are provided. For Vienna Design Week, the Bar Non-Lieu was installed at a gallery space opened by Breaded Escalope with fellow Vienna studio Chmara.Rosinke and designer Patrick Rampelotto. The Ganz Neue Galerie, located off Sonnenfelsgasse, is intended to provide an exhibition space and meeting point for creatives that "see genre designations of 'art' and 'design' as restrictive and outdated". Chmara.Rosinke also created a Futurist kitchen installation at Vienna's MAK museum for this year's edition of the city's annual design festival, which took place from 25 September to 4 October 2015.